I just love creative, unexpected touches in floral arrangements, and one of my very favorite unconventional touches is the use of fruits and vegetables. They can add such a dramatic element--often at a very affordable price if you take advantage of what's in season. 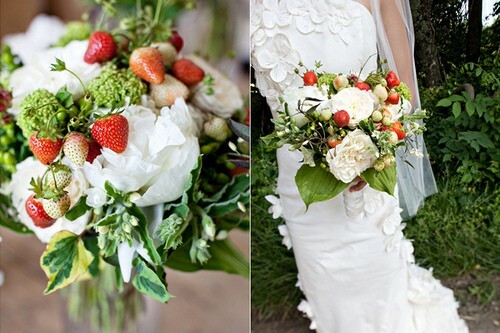 This strawberry bouquet made me swoon. So fresh, so innovative! 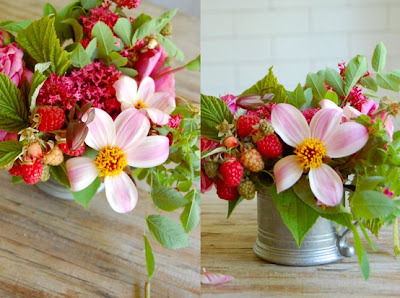 And how incredibly sweet, simple, and beautiful is this arrangement with raspberries? It conjures such happy memories of my grandparents' raspberry patch, and utterly spoiling my dinner with those sweet, sun-warmed berries. 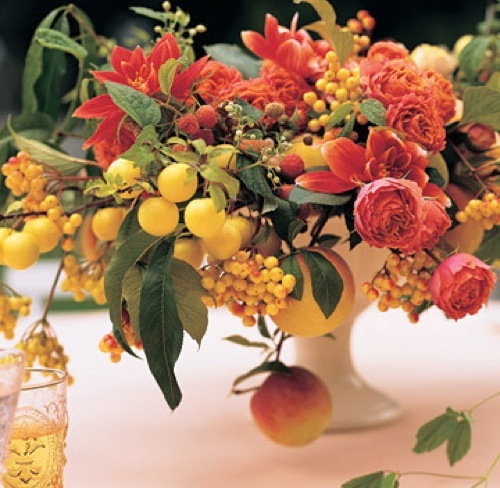 That's exactly what a good floral arrangement can do: set the scene and evoke a feeling. I just love this color palette. And raspberries and peaches--my two favorite fruits! 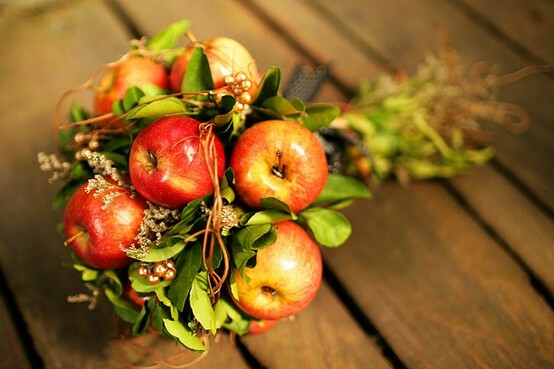 In the fall, take advantage of bountiful apples to create striking but simple arrangements. Something like this looks absolutely stunning, but is very easy for a DIY project. I don't think I've ever seen a more elegant fall bouquet. Apples and some filler. How easy?? 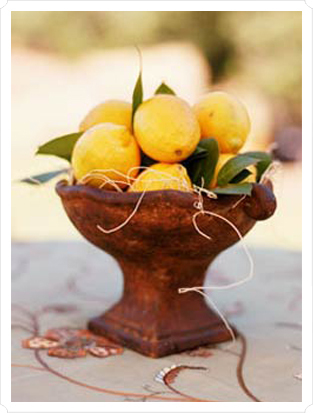 We often associate lemons with summer and lemonade stands, but they actually ripen in January. They last an incredibly long time on the tree, however, and I can find all the free citrus I can handle here in the Phoenix area until early May. 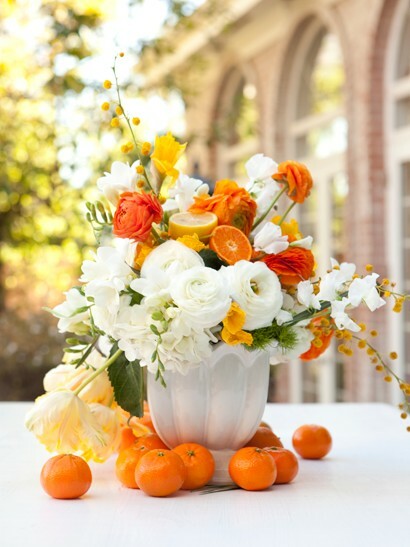 I love simple lemon arrangements like this! Another absolutely doable, easy DIY floral project. Don't forget vegetables! How fabulous is this bouquet with artichokes? 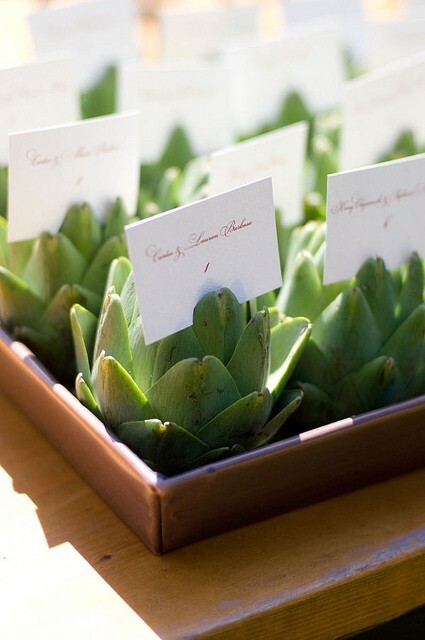 What a clever way to arrange the table cards! It looks like a succulent garden. Think beyond roses and carnations! 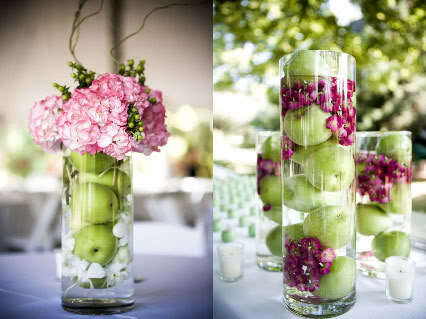 Don't be afraid to incorporate fruit, grasses, seeds, succulents, etc., in your floral arrangements. Often these items are right out your back door--perfect for the do-it-yourself entertainer. I loved the paper flower wall so I used it at our school's Father-Daughter dance. The theme was butterflies so I made this wall as the backdrop to our photo station. Everyone loved the idea! I'd like to send a picture of it to you but I'm not sure how yet. Very pleasing blog! Have never seen such bouquets. Will love to have them for my bridal shower as will look truly unique. Going to engage a same day flower delivery service to Deliver Flowers for the event as they are quite reputed for it.